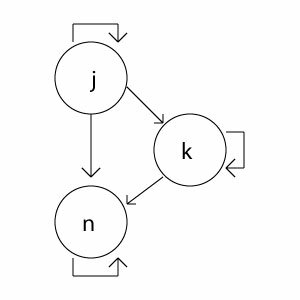 I’m going to attempt to provide a short overview of Modal logics, using the Possible Worlds Semantics frameworks to illustrate some of the points. I owe the majority of this discussion to Rod Girle’s book “Possible Worlds”, which is great introduction to the topic and many of the issues surrounding it. Surely any mistakes that follow are of my own devising. Modal logic refers to a broad family of qualificatory logics, but most strictly refers to Alethic modality, which qualifies the truth of judgement statements with the operator “necessary”. 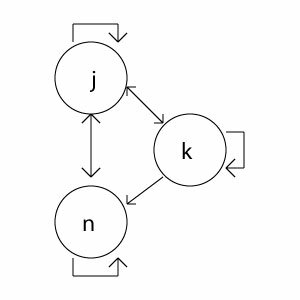 Modal logic is achieved by adding qualifying operators such as “necessary”, most often represented by a box, to propositional logic. 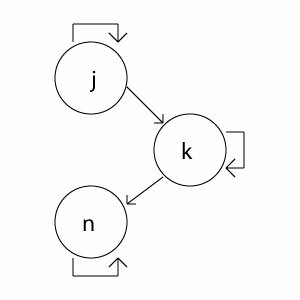 The Necessitation Principle – If A is a theorem in K, then A is necessary. 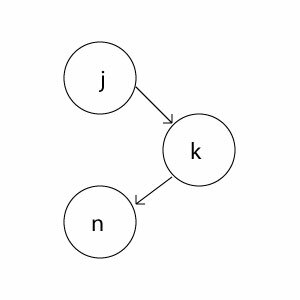 The Distribution Principle – If it is necessary that (if A then B), then (if it is necessary that A then it is necessary that B). P is impossible is definable in terms of: it is necessary that not P.
P is contingent is definable in terms of: it is not necessary that not P and is not necessary that P; or put another way P is contingent if it is possible that P and not-necessary that P.
As was mentioned, K is a relatively weak system, so, while it would be desirable that from K we could say If it is necessary that theory A then A is true in the system, this is not possible without adding this as an axiom to the system, which produces a self-reflexivity. When this axiom is added to K the resulting system is often referred to as T. What this means will hopefully become clearer later, when we look at CI Lewis’ modal logics next. CI Lewis developed a number of the initial systems that strengthened modal logics in various ways. He produced the systems which are known simply as S1, S2, S3, S4, and S5. I’ll not go into all of these systems in detail, but will look at S4 and S5 as a matter of comparison to show how the imposition of additional axioms revise the ways in which these systems have distinct access to possibility. Epistemic, or “it is known that”. Doxastic (Belief), or “it is believed that”. Temporal, or “it has been the case that”, for a modal logic of pasts, or “it is going to be the case that” for a modal logic of the futures. So that each of the worlds has access to one another and itself, so accessibility is universal. Contrasting this with S4, we can see that S4 is asymmetrical, which means that the relationship is only one way — so most modal logics dealing with temporality are themselves variations upon S4. 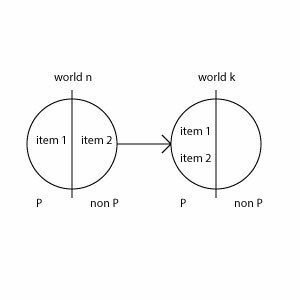 So, while all of the above statements are true for both worlds, in world k, it is not possible for some x to be non P, since world k does not have access to world n. So it is not possible for anything to not be P in k. There is a lot more that can be said about these relationships, and further scenarios would give further clarity, but for the sake of time, I hope this is somewhat illustrative regarding how distinctions between access affect the relationships between worlds. Other possible worlds are things of the same sort as the actual world – “I and all my surroundings”. The indexical analysis of the adjective “actual” is the correct analysis. Possible worlds cannot be reduced to something more basic. There are two ways of tackling this. One is by simply by denying statement two, that other possible worlds are of the same sort as the actual world. This is still a form of modal realism, but one that makes a strong distinction between the actual world and possible worlds. On Lewis’s account, the only thing distinguishing the actual from the other possible worlds, is the indexical, and since indexicality is available from any world in which the account is presented from, it seems to lack any sufficient distinctions aside from perspective — so one would need a stronger definition of actual. The other way to attack modal realism is through following a reductionist account, or what Lewis perjoratively calls ersatz accounts. This involves the development of either epistemic and/or doxastic logics to overcome the inflation of existing entities, and the reduction of those entities through belief revision. Lewis would of course reject these positions, but we need not accept the existential import as basic as Lewis does, and it is unclear whether or not accepting the existential basis is any more virtuous, given that it leads to the inflation of metaphysical entities. 1. Girle, Rod (2014-12-18). Possible Worlds. Taylor and Francis. Kindle Edition. 2. All of the above diagrams derive directly from Girle’s book, and I owe much of the discussion to him, however I have selected, reworked, and truncated it for brevity. Credit where credit is due. Again, mistakes are my own. 3. Lewis, On the Plurality of Worlds, 227.